While researching for an unrelated About Town article, I came upon an interesting 1908 New York Times story recounting the costs and causes of forest fires in New York State. Among a variety of fire-causing culprits were the honey bee hunters. In their effort to subdue honey bee colonies and pillage the honey, the hunters used smoke to calm the bees and keep them from attacking. Where there’s smoke, there’s…fire! I recall my father’s story of the local bee hunter taking him as a teenager on a “hunt.” The bee man had a cigar box filled with flour. He would catch a foraging honey bee, put her in the box and gently coat her in white. Releasing her, he would follow her back to the colony and light his smoker. Smoking bees is not always a success, and, according to my father, this expedition was a stinging failure. The colony was high in a tree and the hunter felled the tree to reach the prize. My father instantly decided against bee hunting as his life’s work. Though honey bees get the queen’s share of press for their feats of prowess in the pollination department, they are more often featured today because of “Colony Collapse Disorder” (CCD). On her Facebook page in late November 2015, beekeeper Dena Paige wrote, “Yesterday afternoon we did our final winterizing for the hives. Our method includes reducing entrances to a 1/2 inch, putting screen over that to keep out mice and putting an extra box on top filled with cedar shavings. This creates a warm air buffer above the girls so moisture does not condense when it hits the cold roof. It has worked for us, so we will continue. Got stung a few times just for good measure. Everything was looking good, normal. However we had seen some robbing (by outsider bees) at one of the hives and I assumed it was just a weak hive. When we opened it up… Empty. About 10 bees—which we assume were robbers because they were up in the stores head down. Frozen. No queen. No workers. Just empty. We can only assume we have been affected by colony collapse disorder. It felt like we lost a family member. I know it sounds silly, but we pour our heart and soul out for these little bugs and it is sad when we lose them. We feel like maybe we failed them. We now have 9 hives and we hope for the best this winter. The definitive cause of this hive-killing mystery is still under investigation, but suspects include stress, loss of habitat, unhealthy diets, pesticides, predators, and one I find particularly interesting, inbreeding. Inbreeding occurs because the genetic material of honey bees in the US has been limited. Sue Cobey, known as “The Queen of Queen Bees,” on Whidbey Island, WA, has worked to get the US Department of Agriculture to loosen its prohibition on importation of bee genetic material—live sperm. 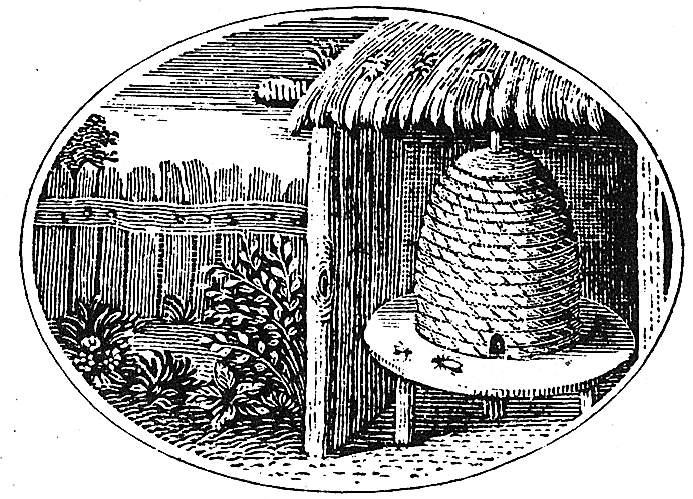 According to a front page Wall Street Journal article titled “A Scientist Teaches Drones and Queens the Birds and Bees” by Joel Millman, Professor Cobey can now work with imported honey bee drones (boys) and sell the specially raised queens which have been artificially inseminated with sperm she has gotten from carefully “screened” drones, home-raised or imported. And no, no “hot honeys” are involved for procuring the male contribution for colony continuation. It’s a pressure thing, not a pleasure thing. Enough said. In the wild, the young virgin queen takes to the air and the big-eyed, single-minded drones from near and far try to catch her and fulfill their only obligation to the colony. In fact, when the weather changes, the drones are pushed out of the hive to die. With CCD so newsworthy, it is good to know we have many kinds of pollinators in the wild including mason and bumble bees. We are most familiar with honey bees because they not only pollinate almost all our crops, but provide us with delicious and infection-fighting honey. Though not native to North America, their importance here is inestimable. The Bumble Bee, is another pollinator in the wild. It is also a favorite for hot house tomatoes. 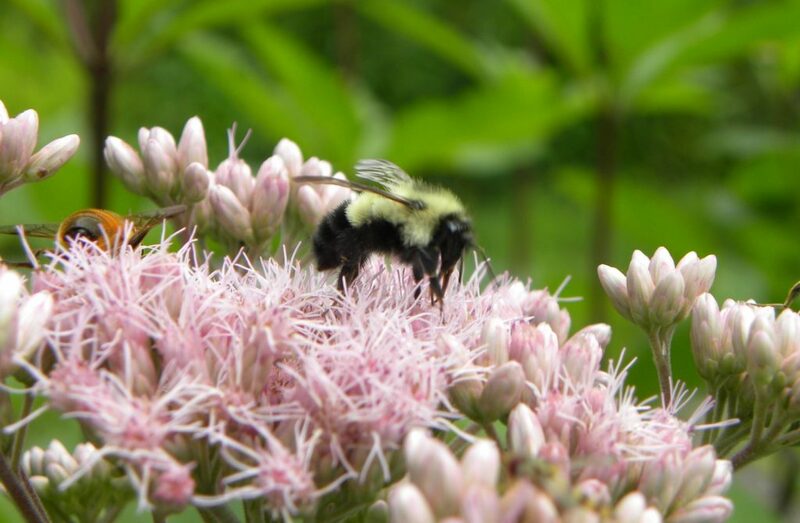 Here she collects pollen and/or nectar from Joe Pye Weed. There are different kinds of honey bees throughout the world. Currently living in the siding of our house is a colony of Italian bees (known as a good honey producer, not prone to swarming and generally gentle). Although they are within a few feet of our main entry door, they don’t bother us as we pass and occasionally bump into each other. Our biggest concern for this colony is the growth of the black bear population in Ulster County. Bears have been known to tear off siding and even roofing to enjoy the fruits of honey bee labor. A recent bear incident took place at John Burroughs’ boyhood home in Roxbury, NY where the bear tore off roofing. When that was repaired, the bear came back a second time and the overall damage was substantial. Bears are also the reason bee keepers put electric fencing around their hives. 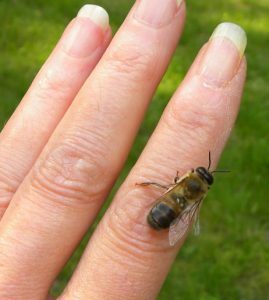 Russian bees are a hybrid developed to take advantage of a natural resistance to variola mites and only came into wide commercial use in the 1990s. In addition to mite-resistance, they winter well in the north east. Inside a healthy colony reside three kinds of bees: workers, drones, and a queen. Workers, all female, live about five weeks during the busy summer and four to six months during the winter. They have many functions within the hive. Workers tend the eggs; feed the larvae, drones and queen; make the honeycomb (wax); collect pollen and nectar; make honey; cool and heat the hive; guard and protect the hive (they die if they sting); take out the “garbage” and the dead; and scout for new hive locations when it is time to swarm. Workers’ jobs change as they age and at any one time there may be 40,000 to 60,000 toiling in a strong colony. In her life, a worker will produce about one twelfth teaspoon of honey. She and her coworkers will travel about 50,000 miles to collect the makings of a pound of honey. Only the most experienced foragers are responsible for finding a new hive location. This feat alone is the subject of a fascinating book, Honeybee Democracy by Thomas D. Seeley, describing the necessary surveying, measuring and judgement of these tiny creatures, and then the process of communication used among these “real estate” agents to choose just the right location for the swarm to call home. Drones live only so long as the colony needs, feeds, and tolerates them. They leave the hive for a few hours each day. Slightly larger than workers, they have very large eyes and no stinger. I have found many drones in the grass near the colony that inhabits my house siding. I picked up a half dozen or so when they had been kicked out of the hive. A queen is the lifeblood of the colony. She is created when the workers feed a larvae (or two or three) on royal jelly. The first queen to mature usually kills any other developing queen. The excess queens are the colony’s insurance policy. Should queen #1 not make it to maturity, one of the princesses then have a turn to murder her sister (s), eliminating potential rivals for the job. She will then mate and spend the rest of her life laying eggs. She can live up to about four years. Doomed drone, one of many collected from the lawn near the entrance of a feral colony. They have large eyes and no stingers. Hive temperature control is a must as bees do not hibernate. They will leave the hive to forage if outside temperatures are above 50 degrees. Below that, they huddle together and their pump wing muscles to produce heat. They will keep themselves at around 92 degrees in winter. When it is too warm they set up air currents with their wings. Another interesting bee fact is why a “smoker“ works to quell bee uprisings when beekeepers want to enter the hive. Apparently, the smoke interferes with the bees’ “danger pheromone,” or chemical scent message, that alerts the other bees to protect the hive–that is to identify and sting the intruder. Smoke also causes bees to gorge themselves on honey. The theory is that gorging is an adaptation to forest fires. For beekeepers, gorging may keep bees too preoccupied to deal with the invasion when smoke is encountered. 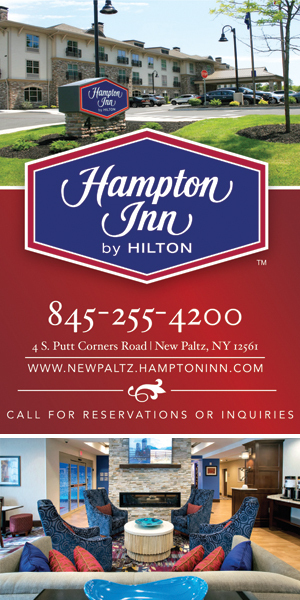 If you want to learn more about honey bees or become a beekeeper, we have great resources in Ulster County to do that. Honey Bee Lives holds regular introductory classes in Rosendale. Contact them at Honeybeelives.org. They also produce a beautiful and informative newsletter available on line. Or you can also join the Ulster County Bee Keeping Association, www.UlsterBees.org. 1 Other forest fires were caused by coal-burning locomotives, berry pickers who practiced burning the bushes to increase yield, lightening strikes, land clearing, hunters, fisherman, smokers (tobacco), blasting, and children.